Background - Bemis Heights 7th October 1777. The Americans have hit the advancing British units hard and caused them to retreat towards their own redoubts. 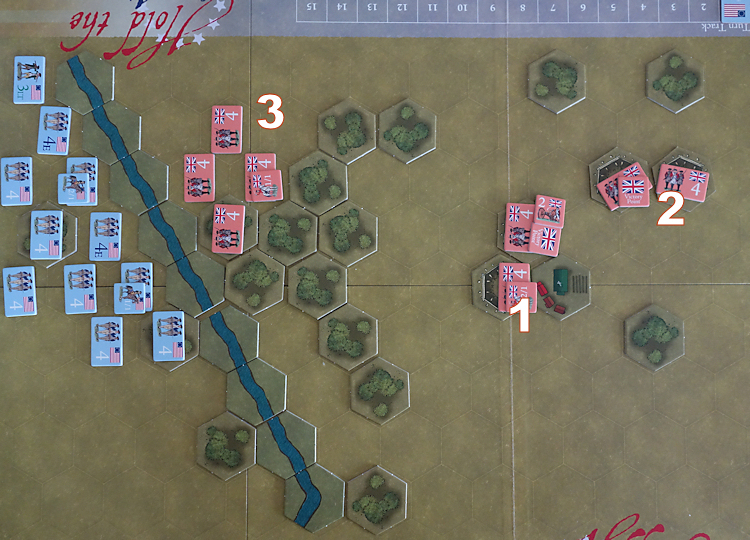 Arnold arrives and takes the American forces onwards to capture the redoubts. The attack pushes Burgoyne from the field. Box artwork - very nice. Scenario - Victory is based upon getting 7 VP’s in 25 turns or less. These are won by elimination of units, plus there are two VP’s amongst the redoubts that the Americans can claim if they capture those defences. The Americans get 4 command points per turn and the British get 2. 1) This pair of fieldworks forms the lower redoubt. The British artillery is located there and there is a VP token. 2) The upper redoubt, also containing a VP token. 3) The forward British units. Plans - The British forward forces will fall back slowly onto their redoubts, intending to slow the enemy advance and then bolster the final defence. 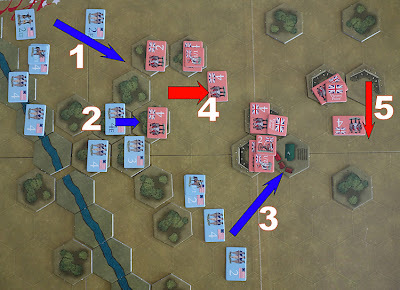 The American force will push towards the redoubt while sending a flanking force to sweep around underneath and attack the redoubts into their undefended rear. Turn 1 - The Americans go first and roll their Command Die (1,1,2,2,3,3) and score 2, which they add to their base command value of 4, giving 6 Command Points. They use the points to advance both flanks. The British roll 1, which is added to their base score of 2, giving 3 command points. This allows them to have 3 units drop back. Note - It costs 1 point to move or fire a unit and 2 points to enter melee. Turn 2 - The sides roll for command again and get exactly the same results. 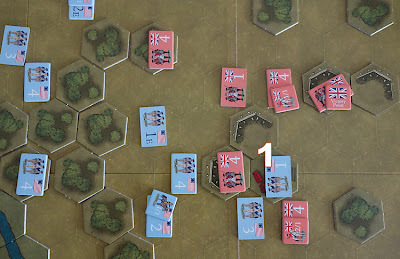 This allows the American flanks to press on but the British are left with the decision of whether to pull 3 units back or just pull 1 back while engaging in melee with one unit. The American Light Infantry are in the open and the temptation for the British to attack is too great. The defenders take a morale check and fail, this means regardless of the battle result, they will retreat 1 hex after the battle. The British roll 3D6 but only inflict 1 hit on the light unit. Their counter flips from strength 3 to strength 2 and they retreat. On reflection, this was not such a sensible attack as it leaves the British force rather strung out. At the lower redoubt, the British move their artillery 1 hex into the lower fieldwork to counter the emerging American flanking move. 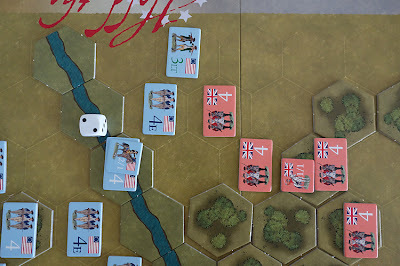 1) The American flank attacks, but pulls back after getting a bloody nose. 2) The British unit is in the last defensible hex before the redoubts are exposed to frontal assault, but the lone British unit is likely to be overwhelmed. 3) The American right flank moves out of cover to sweep under the lower redoubt, but it is raked by artillery fire and accurate long range musket fire, halting that advance. 4) The British have managed to retain a surprising degree of cohesion and are pulling back in an orderly manner. 5) With the top of the board looking safe, the British start to transfer some strength to the woods below the redoubts. 1) The Americans have been stalled with heavy casualties. 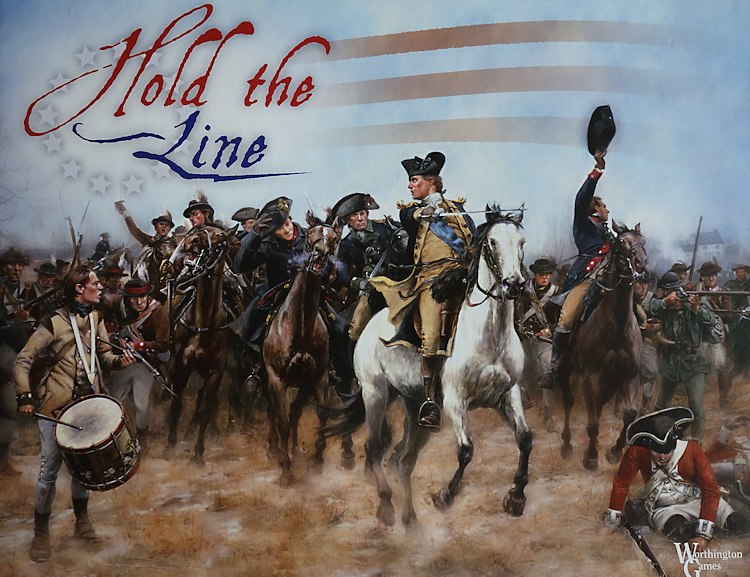 The British are still holding up the American advance. 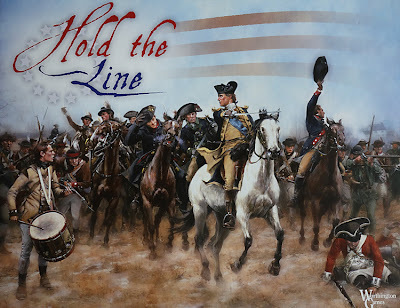 2) The Americans have assembled a strong strike force in the centre, but in this system there are seldom enough command points to get everyone into the battle zone - now is the time for the Americans to get on with it, further delay will cost them the game. 3) This wing took heavy casualties and fell back, it has now mostly rallied and is ready to re-new their assault. 4) The British have gained enough breathing space to re-organise their defences. 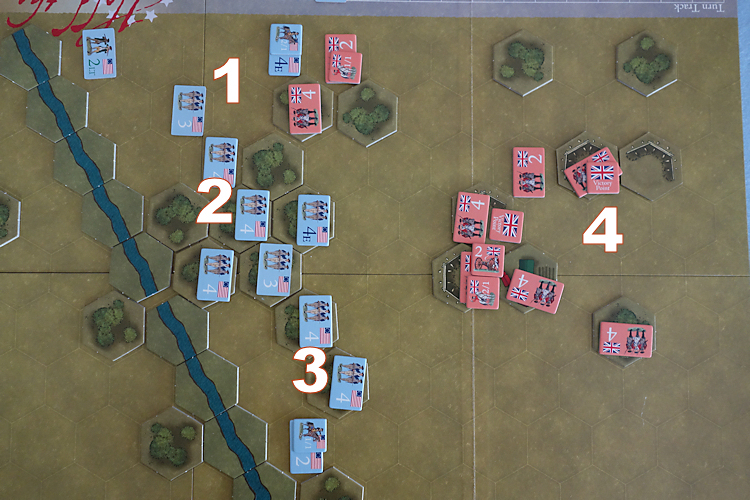 Turn 14 - The American Elite formation (top of the map in the above photo) has smashed the opposition directly in front of them, the way forward is starting to open, but their light infantry (who could best exploit this gap) has been left behind. The above shows the assault on the lower redoubt. 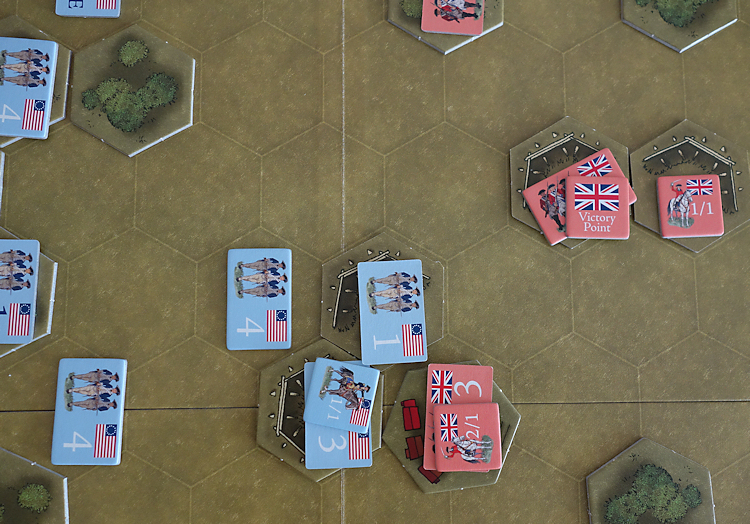 British defensive fire has been largely ineffective and now the American units are up close. They reduce the British infantry (top) from strength 4 to strength 1 and the artillery loses a strength point. 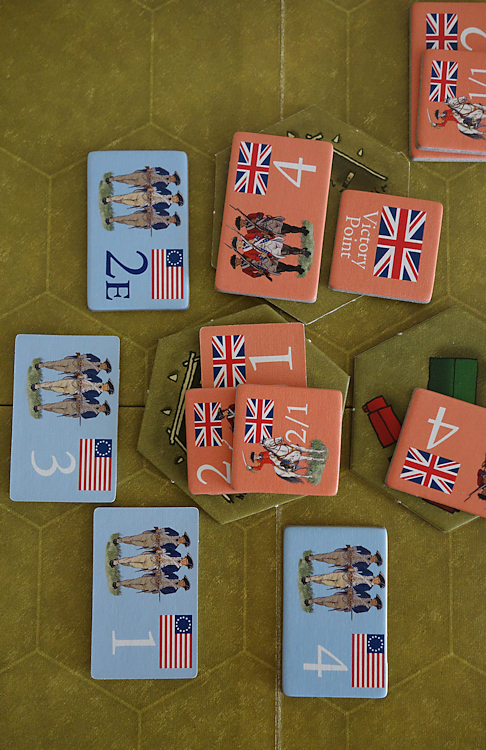 The Americans take heavy casualties but keep the pressure up. 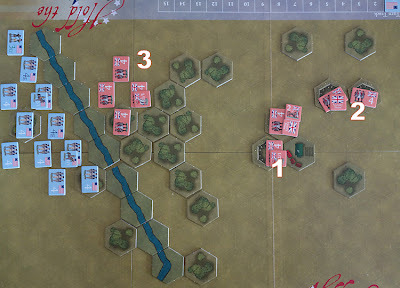 Note - even though units lose strength, their firepower stays the same, so in this situation, the American player has to decide whether to withdraw to save units from certain elimination or whether to stay and make that final push to capture the redoubts. 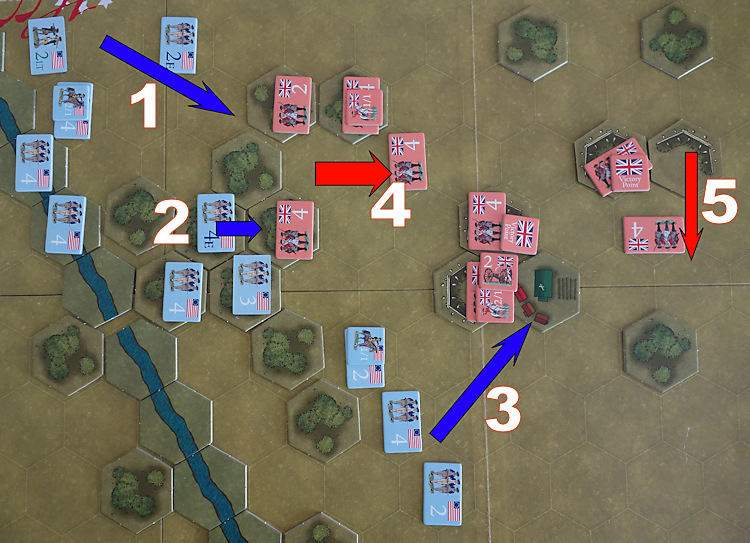 Turn 17 - The Americans take both fieldworks on the lower redoubt, but an immediate counterattack brings them both back under British control. The American units are so badly mauled that they have to pull back and hope that fresh units can launch a further attack in time. The strong (strength 4) American unit at the bottom of the above picture advances into the town (the British vacated it when they counterattacked into the redoubt) and from here they can fire into the undefended rear of the fieldworks. 1) The American unit in the town has been reduced to strength 1, but their other two units give hope that the defenders will be overwhelmed. Over the next couple of turns the British unit in the fieldwork is reduced to strength 1 and it retires to join the other strength 1 unit above it - that becomes a fatal mistake as both these units then make easy targets for removal from play. Turn 24 - The Americans have 6 VP's (need 7) and there is just one turn to go. It is so typical of this system that victory can fall to the last die roll. Turn 25 - The Americans have possession of the lower redoubt (and the VP that it surrenders). They are not close enough to the enemy or strong enough to ensure a victory by way of melee, so two of their units take a chance at firing at long range at the two British units mentioned above that had each fallen to strength one. The firers are lucky and they get their final VP. Conclusions - One of the challenges with this system is that the game clock is very strict and you must press on if you are to get your victory. This often means that over the course of the game, you will not get enough command points to move your entire army, so having a large force does not guarantee it will all get used to any advantage. The counters in this game are simply lovely. They are large and thick, with the corners already cut with slightly rounded shoulders. The system does not have facing rules but the linear counters tempt you into placing them with a purposeful facing - that might make an interesting house rule to add. In our game today, the Americans had their fair share of poor rolls on the command dice, never-the-less, they did manage to get quite a lot of their forces forward. I have played this scenario a few times and feel that in this particular replay, the main influences in the game were 1) the Americans were hampered on their left flank by a very dogged forward defence of the British, which the Americans could not dislodge and 2) on their right flank, their initial assault at the redoubts suffered very heavy casualties, so the troops had to fall back, causing delay while they rallied and therefore their effective second assault came rather too late in the day. Solitaire - It is a two player game that plays fine solitaire. The random number of Command Points each turn helps give the player uncertainty as to what exactly the other side will be able to do in its next turn. Complexity - Described on the package as ‘2 out of 10’, that seems about right. The advanced rules add very little complexity and with so many scenarios to play, familiarity will mean the system stays in memory. The rules are an easy read and there are good illustrated examples. Size - This is a bookcase sized box with a 6 panel mounted mapboard. The game does not need play aids, so just some space off board to roll dice and keep replacement counters is all that is needed. Time - The package says 1 hour and in most cases that is plenty of time, including setup.